It&apos;s been a busy few weeks since my last post. The camp scene is in full-swing and so are fun times in the ATX! I just wrapped Scary Film camp at the Austin Film Society/Film Studio and we made some really awesome short films. Added bonus: a tour of Hawgfly Productions, Inc., they do a lot of the creepy special effects for many of the movies shot in town. Movies are made here all the time--check out movies Made in Austin from the Austin Film Commission. So things can get warm in Austin. I have a formula for beating the heat. First, go to Deep Eddy Pool and second, get my all time favorite treat - Jim Jim&apos;s, a must have when you come to Austin. Deep Eddy is the oldest swimming pool in Texas and during the summer they show movies that you can watch while floating around the pool. Staying true to the Austin vibe, I went to Blues on the Green at Zilker Park. 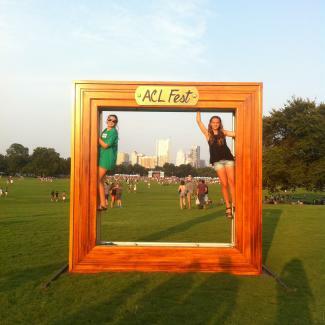 It&apos;s also where the Austin City Limits Music Festival (ACL) is held in October. I&apos;ll be going to ACL for the first time and I get to see Lorde and watch my mom try and act cool during Pearl Jam. The park is home to my other favorite swimming spot Barton Springs Pool and the Zilker Hillside Theatre where they perform summer musicals. And no matter how old you think you are they also have an awesome kiddie train. We also spent some time in the Hyde Park neighborhood this week, where there are really cool shops and restaurants. Great food at the Hyde Park Bar & Grill, lots of cheese to sample at Antonelli&apos;s shop and my mom&apos;s favorite key lime pie at Quackenbush Bakery- or Quack&apos;s as it&apos;s known by the locals. I&apos;ll be back in a few with a final summer update before school starts with a report on the Paramount Theatre and Stand Up Comedy Camp. Sydney Chase is an active Austinite, 7th-grader and local volleyball and lacrosse player. Follow her Austin summer-camp journey for great ideas on how to have the best local experience with your family and young friends while in Austin!